Santander Asset Management is a high-performance global banking firm that develops bespoke financial solutions for private investors and institutional clients. Rapport’ were approached to cost manage and deliver additional workspace to accommodate expansion on the 12th Floor at Santander’s London HQ. As a pillar of Santander value proposition, comfort, and discretion emerged as key design drivers. The design relies on translucent surfaces and a restrained colour palette. 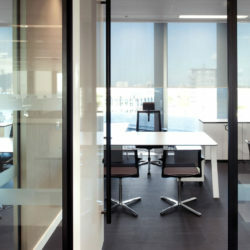 Together, these allow natural light to bathe the contemporary office space and to visually express Santander’s core values.